Microsoft IIS is the standard web server for Microsoft Windows computers. The EZSurvey web CGI that runs on IIS is named ezs.exe. It is a compiled CGI that comes with EZSurvey and does not require you to compile it; it is already compiled. Directory browsing allows others to see all contents of the directory. Enabling browse access can be a security risk. 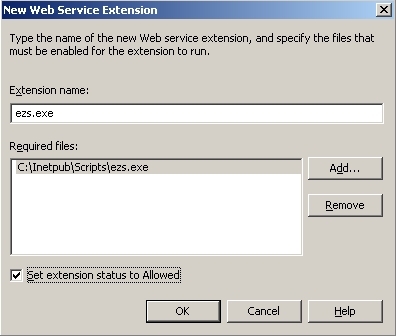 Executable permission allows you to run the ezs.exe program, which is the survey engine. If you are using the ISAPI or PERL option, ezs.exe will be replaced with ezs.dll or yoursurvey.pl, respectively. Read access should be disabled as well to keep others from viewing critical files, such as the data file. If required, you can individually allow read access to the .html file, which is usually necessary for single page surveys. There are two types of permissions on Windows Server with IIS. 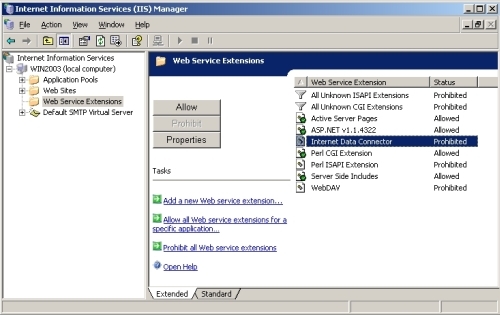 Web server permissions in IIS. File level permissions in Windows Explorer. The Windows web server, called IIS, uses an account called IUSR_COMPUTERNAME. Where COMPUTERNAME is the name of the server. "Write" permissions must be allowed for the IUSR_COMPUTERNAME account or the Users group. Right click on the projectname.asc file. Select Properties and then the "Security" tab. You should see a list titled Group or user names. Add the user IUSR_COMPUTERNAME, click Advanced if you want to select the user from a list. Once the user is added, select the Allow box for Write permissions for the IUSR_COMPUTERNAME account.